Like a number of United Methodist churches in the Louisiana Annual Conference, First UMC in Baton Rouge has had a long standing involvement with mission work in Cambodia. On Easter Sunday, Esther Gitobu, GBGM missionary to Cambodia, along with Sophany Heng, assistant coordinator for Women’s Programs in Cambodia , worshiped with First UMC, a congregation that has done so much to support United Methodist ministries in the impoverished country. 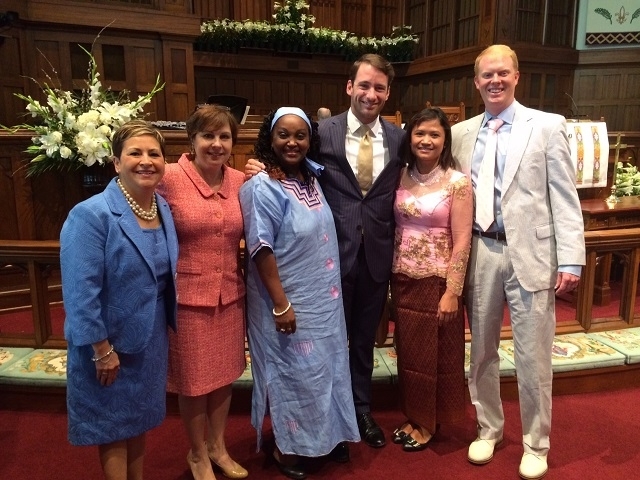 Bishop Cynthia Fierro Harvey is pictured on Easter Sunday with Gitobu (in long blue dress) and Heng (in pink and maroon), along with Mary Kay Carleton, Brian McNabb and Reid LeJeune. First UMC has been in relationship with Cambodia since 2005, when Gitobu was first introduced to the congregation; the church subsequently began supporting Esther in her work as a missionary. In 2007, a team of five women from First UMC--Judy Foust, Cooky Coffey, Kristen Chastine, Mae Belton and Rev. Elaine Burleigh—journeyed to Cambodia. During this visit, the team members visited a congregation in the village of Samrath. In 2008, First UMC made a commitment to help the church build a sanctuary and a parsonage, which was completed and dedicated in 2010. Since that time, the church has also built two dormitories for the girls in this village so that they can have a safe place to stay while they attend high school. Currently, 33 girls are living in the dormitories. The Baton Rouge church has not only helped to build Samrath Methodist Church and the dormitories, but has also finished a parsonage and a well. Funds are already pledged for building a second sanctuary in Raskmei Village. First UMC is partnering on this project with St. Luke Simpson UMC in Lake Charles. Construction will begin this July, and the dedication will take place in February of 2015. First UMC has supported an ongoing crafts sale, featuring items created by Cambodian women through United Methodist sponsored micro-industries. The proceeds from the sales help strengthen these industries back in Cambodia. A scholarship program supporting college students is also funded by First UMC. So far, there are 69 students attending different colleges in Cambodia with the help of this scholarship program. Esther and Sophany recently traveled with a group from First UMC to the UMW Assembly in Louisville, Kentucky and then on to Alexandria, Virginia to participate in the Cambodian Consultation. Along the way, the group visited Trinity UMC in Knoxville, Tenn. and were served a great dinner. Sophany and Esther took this opportunity to thank Trinity UMC for their support of their mission work in Cambodia. Pictured, left to right, are: Tom Abbott; Gitobu; Rev. 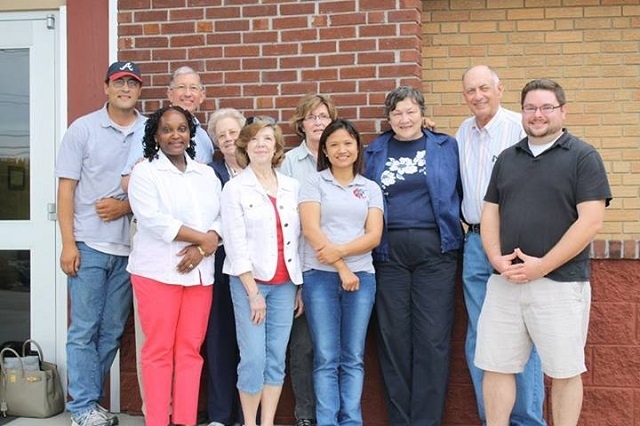 Don Thomas, pastor of Trinity UMC; Cooky Coffey; Sandra Loy; Judy Foust, director for the crafts ministry at First UMC; Heng; Mary Abbott, Tom’s mother; Ken Abbott, Tom’s father; and Rev. Samuel Ward, associate pastor for Trinity UMC.